Stryper is a Christian glam metal band from Orange County, California. The group's lineup consists of Michael Sweet (lead vocals, guitar), Oz Fox (guitar), Tim Gaines (bass guitar), and Robert Sweet (drums). In 2004 Gaines left the band and was replaced by Tracy Ferrie (bass guitar) but rejoined in 2009. Formed in 1983 as Roxx Regime, they would change their message and name to Stryper to go on to be the first Christian rock band to be recognized by the mainstream. In 1983 they were signed by Enigma Records and released their first album The Yellow and Black Attack. By the mid-1980s, Stryper saw their most successful period starting with the release of To Hell with the Devil which achieved Platinum sales status. Stryper would go on to release two more Gold albums before breaking up in 1992. In 2003 Stryper came out of retirement for a reunion tour and subsequently signed a multi-album contract with Big3 Records in 2005. The name "Stryper" derives from the King James Version of the Bible. "But he was wounded for our transgressions, he was bruised for our iniquities: the chastisement of our peace was upon him; and with his stripes we are healed." The reference, Isaiah 53:5, is frequently included as part of their logo. Stryper's drummer, Robert Sweet, also created a backronym for their name: "salvation through redemption, yielding peace, encouragement and righteousness". ↑ Hale, Mark (1993). "2869". Headbangers (First edition, second printing ed.). Ann Arbor, Michigan: Popular Culture, Ink. p. 336. ISBN 1-56075-029-4. 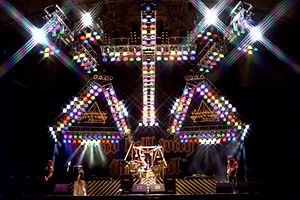 ↑ "The Stryper Story". Stryper. Retrieved 2010-07-28. This page was last changed on 7 February 2014, at 23:23.